This is a series of graphs which show the results of our third CAFE group meeting held in the Welcome Centre, adjacent to Coventry University Technology Park, on Friday 21stJune 2013. 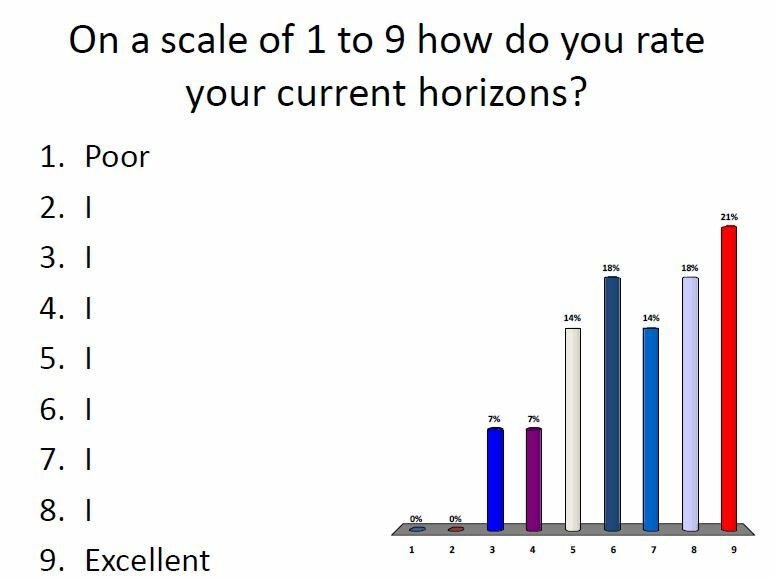 The focus of this survey was WEALTH and HORIZONS as perceived by the “expert” group of older people. It is representative only of their views of themselves and doesn’t purport to be typical of other groups of older people in Coventry. The commentary on the graphs is entirely my own personal reflections. ( Other posts in this series can be found either by clicking on “CAFE Project” in the Tag Cloud or by clicking on “GrumbleSmiles Trust” in the Topics list). The good news here is that within this group everyone has a positive view of the horizons in front of them. 63% of the group have a very positive view of the future. This is quite a contrast with the stereo typical view of older people being a burden on society and not having much to look forward to. Positive Mental Attitude must be one of the keys to a happier later life which is why it is important to remove as many of the barriers which can lead to negativity. This entry was posted in GRUMBLESMILES TRUST and tagged "A Horizon Ladder", CAFE PROJECT. Bookmark the permalink. I agree with your findings, and am very asured that the 65’s+ have such a positive outlook on life. As I now gently age and step inside the golden age of retirement, I look around. While I have my health and family, I count my blessings. What i cannot help doing is looking at those older than i or infirmed, and while I am able to vote, I trust I can make a difference in general terms, with respect to the elderly. I hope that those that I help who are older are greatful, and those that are younger will remember my deeds and when my time comes, treat me with compassion and dignity as a person. In these times of recession it may be difficult: However I do have faith in human nature in general! What you have embarked on in Coventry John needs and requires conviction and courage. Best wishes for your endevours JOhn. I agree that it is very important to have a positive mental attitude + that some older people lack it.. It is very difficult to reverse this situation in my experience of some older people I have known, especially those who have gone into Residential Care. (They prefer not to be there + feel they are waiting to die) As everyone is an individual it is not easy to have one simple solution to the problem of having a negative attitude, but preventing social isolation + giving something positive for the person to look forward to does sometimes help.